I am endeavoring to read more books that share bits of American history. The Eulogist by Terry Gamble takes place in the Midwest in the time just before the Civil War. I thank TLC Book Tours for sending me a copy at no charge for my honest review. From the author of The Water Dancers and Good Family, an exquisitely crafted novel, set in Ohio in the decades leading to the Civil War, that illuminates the immigrant experience, the injustice of slavery, and the debts human beings owe to one another, witnessed through the endeavors of one Irish-American family. Cheated out of their family estate in Northern Ireland after the Napoleonic Wars, the Givens family arrives in America in 1819. But in coming to this new land, they have lost nearly everything. Making their way west they settle in Cincinnati, a burgeoning town on the banks of the mighty Ohio River whose rise, like the Givenses’ own, will be fashioned by the colliding forces of Jacksonian populism, religious evangelism, industrial capitalism, and the struggle for emancipation. After losing their mother in childbirth and their father to a riverboat headed for New Orleans, James, Olivia, and Erasmus Givens must fend for themselves. Ambitious James eventually marries into a prosperous family, builds a successful business, and rises in Cincinnati society. Taken by the spirit and wanderlust, Erasmus becomes an itinerant preacher, finding passion and heartbreak as he seeks God. Independent-minded Olivia, seemingly destined for spinsterhood, enters into a surprising partnership and marriage with Silas Orpheus, a local doctor who spurns social mores. When her husband suddenly dies from an infection, Olivia travels to his family home in Kentucky, where she meets his estranged brother and encounters the horrors of slavery firsthand. After abetting the escape of one slave, Olivia is forced to confront the status of a young woman named Tilly, another slave owned by Olivia’s brother-in-law. When her attempt to help Tilly ends in disaster, Olivia tracks down Erasmus, who has begun smuggling runaways across the river—the borderline between freedom and slavery. As the years pass, this family of immigrants initially indifferent to slavery will actively work for its end—performing courageous, often dangerous, occasionally foolhardy acts of moral rectitude that will reverberate through their lives for generations to come. Terry Gamble is a Phi Beta Kappa graduate of the University of Michigan. She lives in Sonoma and San Francisco, California. Find out more about Terry at her website. James, Olivia and Erasmus Givens are the remains of a family that emigrated from Ireland to the United States. The family has ended up in Cincinnati after being abandoned by their father. James develops a candle wick that leads him to running a very successful chandlery. Olivia is a woman of her own mind and feels that she will never marry but fate has more in store for her. Erasmus is a bit of a lost soul and he works for James for a while but he often cannot be counted on. The siblings are living in a free state but just across the Ohio river in Kentucky slavery is in full force. It doesn’t touch their lives in an immediate way but the issues that will bring about the Civil War are starting to simmer. As time passes James makes a very prosperous marriage, Erasmus runs off to preach the word of God and Olivia who long thought her time was past finally finds love but it will turn out to be a complicated relationship with a man whose brother holds slaves. Times are changing and feelings about slavery and its abolition are becoming volatile. People are starting to choose sides. The Givens’ family needs to choose on which side it will fall. The Eulogist is a richly plotted novel full of compelling characters. I found myself quite involved in the tale despite the dark themes. I can’t say that it was an easy book to read as it takes place in a very difficult time in this country’s history. The individual subplots surrounding each Givens sibling are all detailed and interwoven with careful skill. Little crumbs dropped in one chapter show up later as more meaningful than you might have expected. I was very confused as to the title of the book and remained that way almost until the end and then all was made clear. 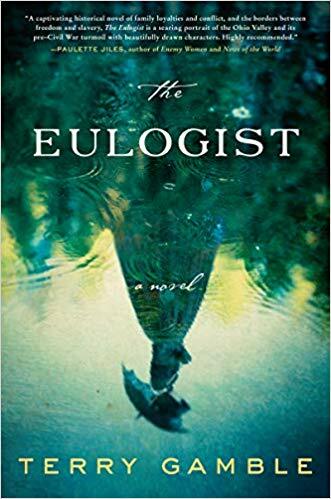 The Eulogist is one of those books you keep to read again for I do believe it will be even better on a second go round. There is just so much to this book. It deserves to be read and it is worth your attention.